hey I also attended this show (hi Kevin!) and likewise it remains in my top ten list of live shows to this day. I had gotten into Yes after a friend (RIP Norman) saw them open for Tull in Hampton Beach, NH in '71 and raved about them. But I never caught them until this show, and so had 6 years of total fanaticism built up and ready to rock. It was all and more I'd hoped for, just stunning. The only downer was, I was above all else hoping for Close to the Edge, and as the intro began, the guy I was with kinda blacked out on his feet - was very hot in there, etc... - and was being held upright only by virtue of the jammed in crowd. So I had to walk/carry him out through the crowd from the front, which was no easy task and took quite a while...by the time he recovered and we made our way back in, Edge had about ended - wah!! But overall, I'm not complaining and it was an electrifying night to remember. I attended this show and to date it's still in my top ten all time favorites. I can remmber the crowd outside surging toward the doors before the show(a bit scary, as in The Who in Cincinnati). I was 18 years old at the time and this show just blew me away. The musianship and the light show was incredible(I think they were using lasers at the time). What a great band! My friend Chip and I head from St.Johnsbury, Vt to Portland Maine ( a typical 4 hour drive to a Yes concert for us up here in Northern New England). Yes is at the Portland Cumberland County Civic Center, Sunday night August 14, 1977. Before, after, and during the show(s) at every break in songs, the overhead "scoreboard" is advertising "ELVIS PRESLEY- HERE TUESDAY AUGUST 17 8:00pm" I remember thinking "big deal, so its Elvis" Chip recalls fans booing every time the scoreboard display this. "Ultimate Trip, Bonus At Center"
PORTLAND - Of the more than 200 disappointed fans assembled outside the Cumberland County Civic Center during the Yes and Donovan concert last night, many said they'd gladly pay if a ticket were available. Scalpers were doing a brisk business, selling ducats at twice their original cost. But certainly, Rick Wakeman's colorful antics on his moog synthesizer are worth the price of admission alone. And there's still the smooth workings of the other Yes-men, which, when blended with Rick's electronic piano poundings, create the ultimate rock trip. As if that weren't enough, there was also an added bonus in talented Scottish singer-songwriter Donovan, one of the poets of the flower children several years back, who has not gone to seed. 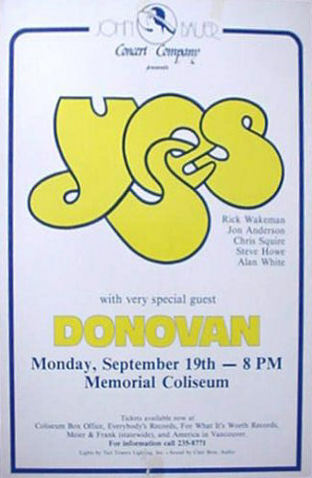 Donovan, who served as warm-up act at the Sunday night concert, was supported by a four man musical group. Yes is probably disappointed that its new single, "Wondrous Stories", which was released from the new LP, "Going for the One" early in the summer, hasn't had any chart action. But they can take heart in the fact that the album is already at number 20 on Billboard charts, and it is still a hot seller. It's also the first LP with Wakeman back at his old stand. The 27 year old artist returned last spring after three years as a solo performer. Originally, Wakeman joined Yes in '71, after leaving the Strawbs. The lanky, long haired rock organist, who favors ankle length capes while he performs on a bewildering array of electronic keyboards, suffered from three heart attacks while touring with his elaborate production "Journey to the Center of the Earth". ON DOCTOR'S ORDERS, he had to rest for several months. Wakeman figures now that now since he's merely the member of a band, it will be less of a strain than if he were the whole show. The millionaire musician once studied classical music at London's Royal Academy of Music. At the time he was 16. Wakeman gave up his traditional aspirations though, when he realized how little such musicians earned and how hard it was to reach the peak of that profession. But, as he told this reporter, during an earlier interview, the school did expose him to a wide variety of musical resources: "I used to nip up to the college's museum when the curator wasn't around and play the spinet and harpsichord they had there." Wakeman is a delight onstage, stealing most of the visual attention with his capes and elaborate musical weavings. For all his flair, the other musicians and particularly Jon Anderson's vocals, provide an instrumental mastery and inventiveness one doesn't often in rock. THEY SHINE especially on such tracks as "Roundabout", and "Long Distance Runaround." Much credit has to go to guitarist Steve Howe, who usually takes the lead in establishing and developing the themes. His dexterous playing is a blend of studied musical ideas and an intuitive, flowing attack that belies the accusation of bland perfection that has been hurled at Yes from time to time.Though they may perform at imes with more expertise than passion, their music isn't at all sterile. Instead, it shines with a freshness and crispness that doesn't seem likely to tarnish soon.